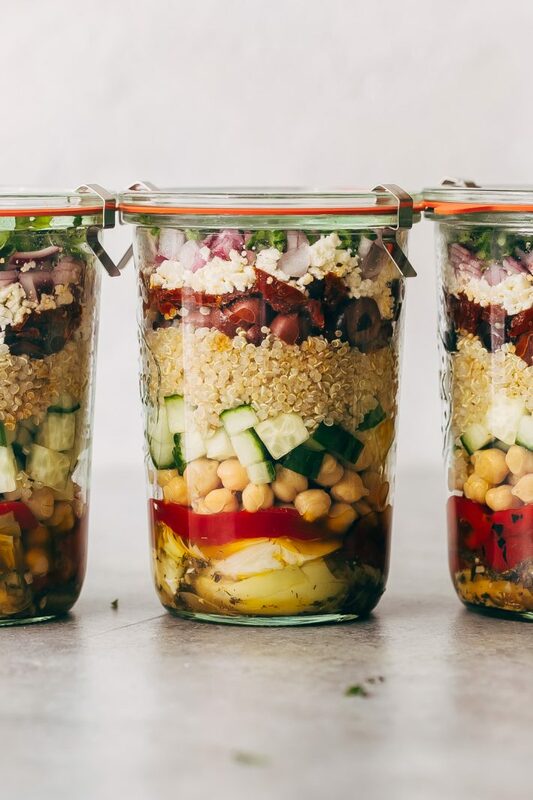 Learn how to make Greek Quinoa Salad Jars for your weekly meal prep! These have the dressing on the bottom and all the fresher ingredients at the top so that they last in the fridge all week long! Stackin’ it tall for the week ahead. This past weekend. What a food tragedy! In fact, this whole week was a mess. I think it’s safer to ask what didn’t I eat this weekend? Indian food on Saturday night, followed by a slice of pie from our favorite late night pie joint. And on Sunday we hit up a food truck festival and ate gyros and Vietnamese fries loaded with shredded meat and banh mi subs! Needless to say, my body is begging for me to press the reset button NOW. We know the drill. Meal prep healthy, easy to grab meals like these Greek Quinoa Salad Jars, so you don’t find yourself standing over the sink eating slightly stale pistachio muffins you stress-purchased from the grocery store when you realized a pipe between the walls of your house was leaking and collecting water at the base. And when too much of it gathered, it spread from the walls to the floor, and your laminate wood floors were squishy, soaked, and oozing water through the plank joints when you stepped on them all throughout your family room. <— yes, this actually happened. No idea what brand of laminate wood we had because the people who flipped our house before we purchased them put them in. Oy Vey! Luckily, hubby did a little digging around and found them at a local retailer, who happened to have them in stock (with a few minor hiccups that the contractor was able to find a solution for.) Otherwise, we were looking at replacing ALL of the laminate floorings in our house because of the 200 square feet that were damaged by the water. I’m still hyperventilating at the thought. Needless to say, last week was an all round stress-eating disaster. 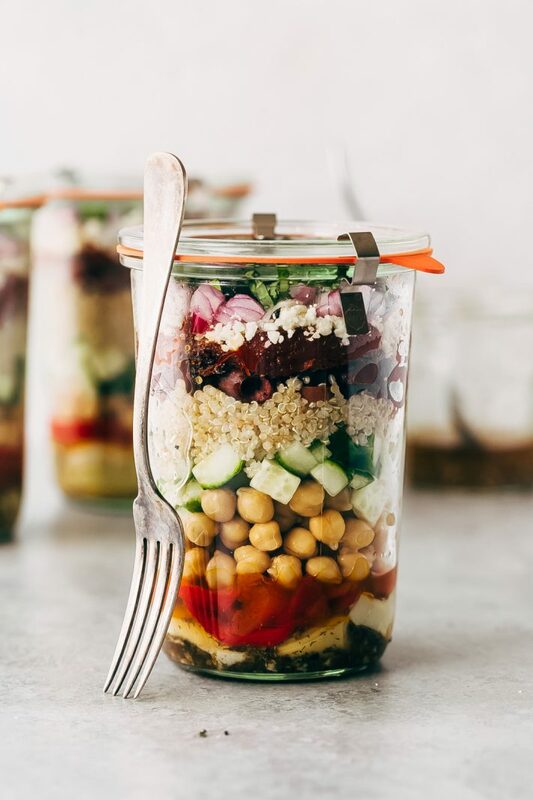 But this is a new week and I’m happy to report I’m grabbing these Greek Quinoa Salad Jars for lunch now. Salad jars. You’ve heard of them, right? The concept isn’t new but it’s one that definitely gives your prepared salad a longer shelf life. It’s different than your usual meal prep salad because everything is layered, starting with the ingredients that won’t get soggy if you put them in dressing. Towards the top, we’ll put the leafy greens and any chopped herbs. 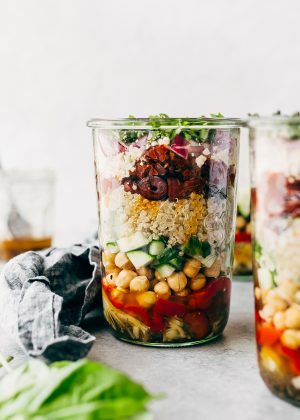 When you’re ready to eat these layered quinoa salad jars, all you have to do is empty the jars into a large bowl or a plate and like magic, the dressing cascades over your salad. It’s a thing of beauty! 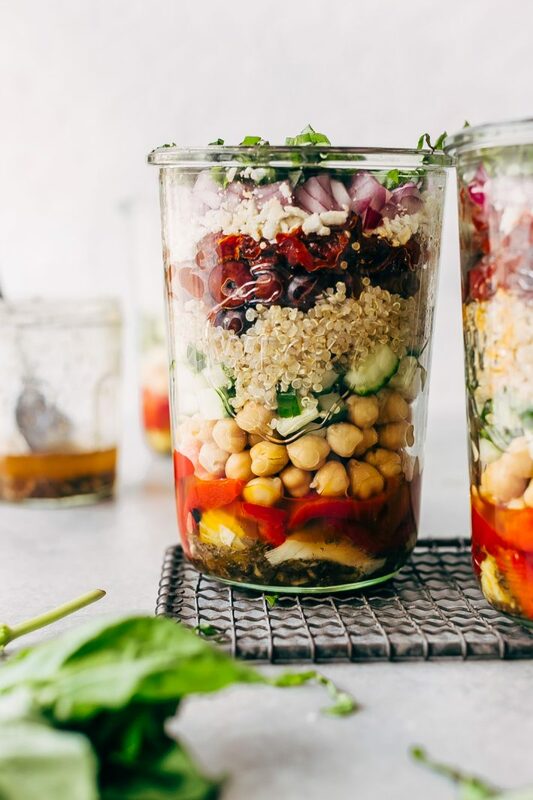 Seriously, take a look, I dumped out the salad and just added a few pieced of shrimp (because I had some in the refrigerator that needed to be eaten) and look how gorgeous these quinoa salad jars turned out. 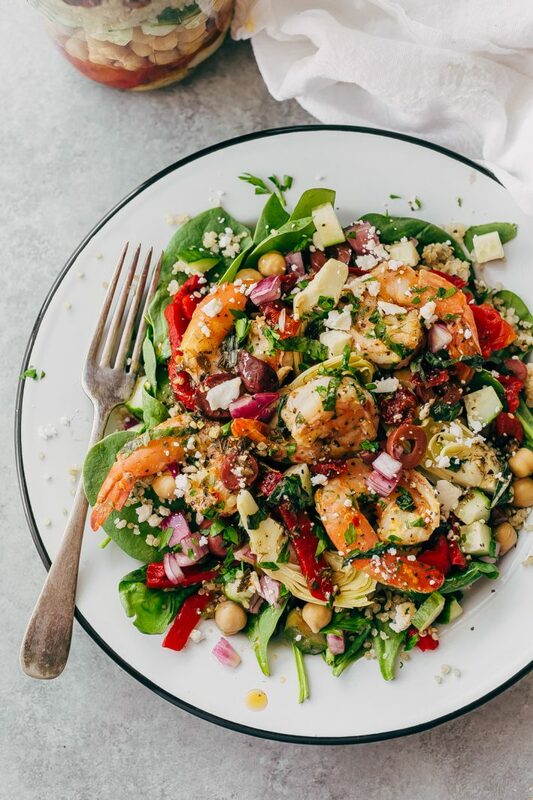 Although my quinoa salad jars are vegetarian, I sometimes like to add leftover grilled chicken  to one of the middle layers or add cooked shrimp right before serving. You can also add hard boiled eggs or diced avocados if you want to keep this meal meatless but still super filling. 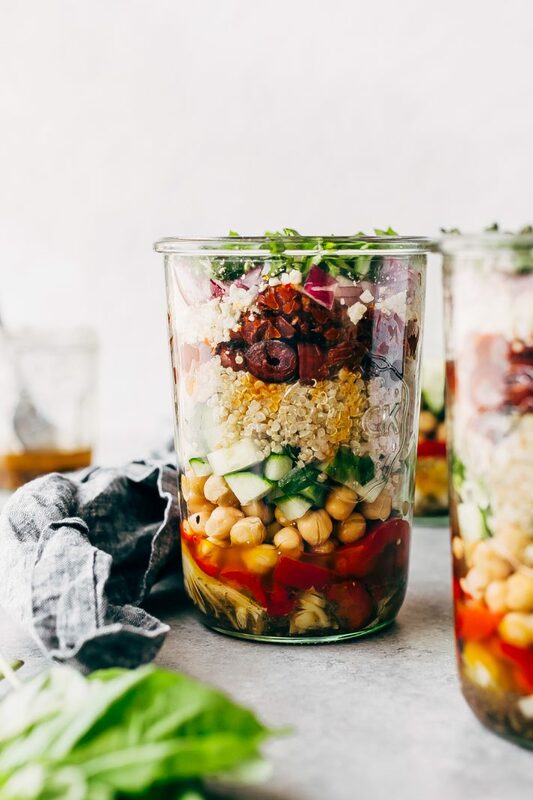 The possibilities with these quinoa salad jars are endless. The dressing is effortless and requires just a handful of ingredients. The key to stretching this dressing is to add just a little bit to the jars and letting the veggies that hang out in the dressing soak it all up. For our dressing, we’re using olive oil, lemon juice, garlic, honey, a hint of Dijon, dried oregano and salt, and pepper. Just pantry staples but when you blend them, they’re the perfect combination of lemon and herb with a hint of sweetness at the end. They balance out the robust sun-dried tomatoes and the artichoke hearts we’re using in our salad jars. 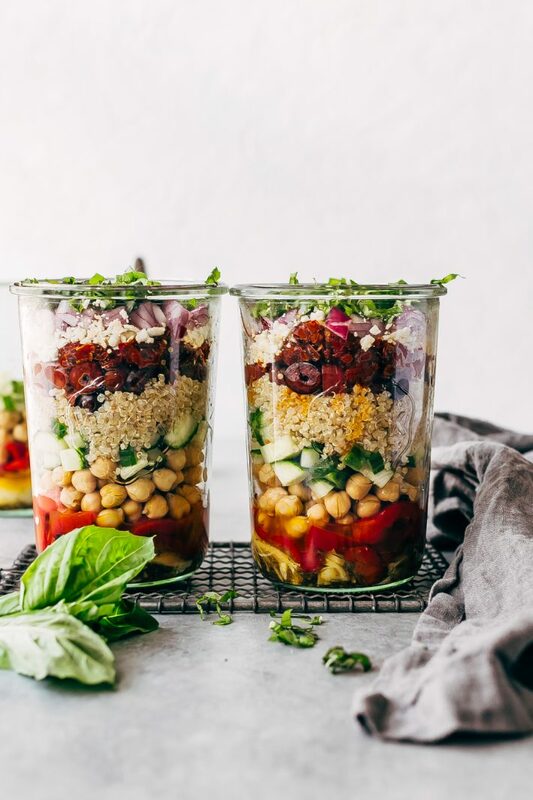 How do you keep the ingredients fresh in these Greek quinoa salad jars? The key to keeping everything fresh when we’re meal prepping salad jars is placing the ingredients that won’t get soggy in the dressing itself. I started with the artichoke hearts because those will get better as they sit in the dressing and soak it up. I follow it up with sliced roasted red bell peppers, chickpeas, chopped cucumbers, quinoa, marinated olives, chopped onions, feta cheese, then the herbs and the lettuce or spinach. Keep in mind that if you add the salad greens to the salad jars, you’ll end up making more jars because believe it or not, the greens take up quite a bit of room! And though I found jars prefilled with lettuce (spinach) were filling for me, the hubby prefers his jars with baby spinach in a zip top baggy on the side. Speaking of jars, here  (affiliate link) are the jars I used. I purchased them on Amazon for significantly cheaper than they are if you were to get them from retail stores. These jars are great because they almost create a self-seal when you let them hang out in the refrigerator. I had to use the clips because the suction on these was so strong! And the chopped basil? Just as fresh as the day I packed my quinoa salad jars. Swap the ingredients for ones you have or like! If you don’t want to use quinoa, you can add cooked pasta, brown rice, pearl couscous, regular couscous, or even farro to the layers. You can swap the beans too! If you like white beans better, you can use those instead. Don’t like an ingredient? You can leave it out. These jars will last about 4-5 days in the refrigerator, we pushed ours to day six just to test, and though most of the ingredients were okay, the cucumbers and onions did start losing their freshness a bit! And there you are. 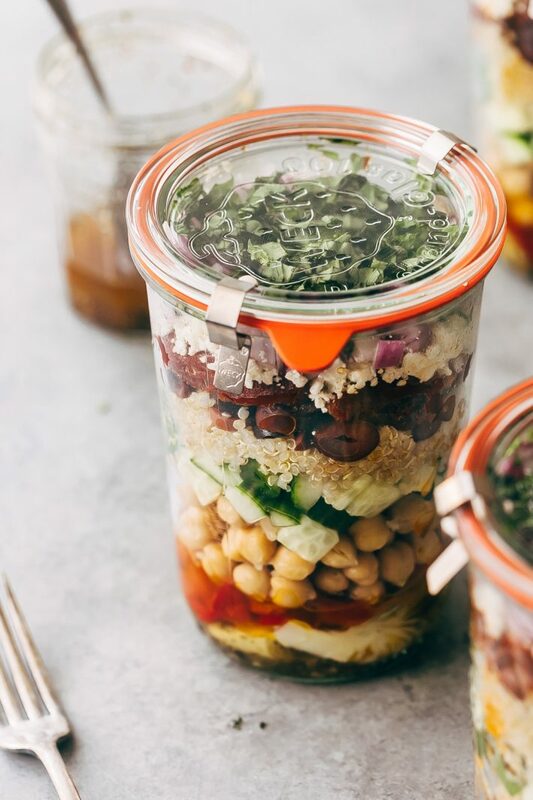 These meal prep salad jars are colorful, flavorful and loaded with filling ingredients. The hubby even said that they were better than the fresh salads he usually orders at work. And that’s just music to my ears!